High-level language and low-level language are the types of programming languages. 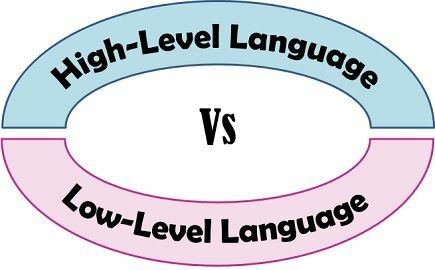 The prior difference between high level and low-level language is that the high-level language is easily interpreted by programmers but not machines whereas low-level language can be easily understood by machines but not by humans. The low-level language contains machine language and assembly language. Translation Requires compiler or an interpreter. Assembler is required while machine language is directly executed. Portability and machine dependency Portable and runnable in any platforms. Non-portable and machine dependent. High-level languages are the programming languages constructed by a combination of mathematical symbols, natural language characters and symbols and modelled by real-world scenarios. In a general way, modern procedure-oriented programming languages are known as high-level languages. These are mainly implemented for the fast and easier development of a program. It does not require to memorize the architecture and registers of a CPU for the development of a program. The compilers are used to translate the high-level language program into machine language. There are various high-level languages like COBOL, FORTRAN, BASIC, C and C++, Java, etcetera. To get an idea about the high-level language, let’s take an example of online shopping. When a user wants to buy something online he/she selects the items and add it to the cart to buy it, then chooses for payment methods. Payment methods include net banking, debit card, credit card or (COD) cash on delivery. The details of the account holder are checked and verified against the bank’s database in the payment gateway. At last, the transaction takes place and the order is placed which is delivered within a few days. The low-level language is considered as low because it goes to the machine level and can determine how hardware elements of the computer actually interact. These low-level languages need a wide knowledge of the hardware components and their configuration. Machine level language and assembly language are classified under low-level languages. Machine Language is considered as the computer’s natural language, which can be directly recognized by the electronic machines. It is a non-portable and machine dependent language which consist of only two binary numbers 0’s and 1’s. Each instruction in a computer exists in the form of binary code. However, it is quite hard to give instructions to a computer in a binary language which means to interact with a computer in a binary language or writing programs in machine level language. The writing, testing and debugging speed in machine language is slow and incautious errors are very common. The machine language is defined by the hardware design of that hardware platform. It is tiresome and time-consuming. Another variant of low-level language is assembly language. In this language programmers uses commands which slightly resembles to common English that is understandable to some extent and interpreted by programmers. Programs are constructed using alphanumeric symbols (also known as mnemonics) instead of 0’s and 1’s. It includes ADD, SUB, MUL, DIV, RLC and RAL as the symbols or mnemonics. Although each program written in a language other than the machine language is translated into machine language. Assembler is used to perform such operations in order to translate the non-machine language into machine language. Every processor is enabled with its own assembly language such as 8085, 8086, 80186 processors have their own assembly language. The high-level language is programmer friendly. On the contrary, low-level language is machine amiable which means it is interpreted by machines easily. Low-level languages take time to execute whereas high-level languages execute at a faster pace. High-level languages are converted into machine specific language with the help of a compiler. As against, with low-level languages, only an assembler is needed for assembly language. When it comes to memory consumption the low-level languages are highly efficient while high-level languages are not. A high-level language is easily understandable whereas low-level language cannot be interpreted easily as it contains a set of long series of 0’s and 1’s. Low-level languages cannot run over different machines as these are not- portable and machine independent. In contrast, the programs written in high-level languages are portable and machine independent. Debugging and maintenance are easier and high-level languages as compared to low-level languages. The low-level languages are mainly used to construct less operational application where simple and specific functions are required such as CNC machine, electronic devices etcetera. On the other hand, high-level languages are used to build operation extensive applications where a long sequence of functions are carried out like softwares used in hospitals, industries and factories etcetera.